SCENT OF DARKNESS: Classic romance between a secretary who hopelessly loves her boss…only to discover he’s a shapeshifter. Oops. TOUCH OF DARKNESS: A deception threatens the love between a woman determined to reveal the evil that killed her family … and the man who has shares those unholy gifts. INTO THE SHADOW: Bad boy shapeshifter brought to his knees by the woman he should never love. INTO THE FLAME: As the Wilder family saga sweeps into its stunning climax, the only Wilder daughter realizes the lie she has lived … and discovers a love lost. STORM OF VISIONS: A bodyguard must guard the woman he loves. But he can’t guard her from her own visions … or her duty. STORM OF SHADOWS: Clueless librarian turned reluctant adventurer by a mysterious man with…talents. CHAINS OF ICE: A wild man must be tamed and returned to do his duty to the Chosen Ones, and only one woman has the strength — and love — to succeed. STONE ANGEL: The one man who can save her is the man who betrayed her…and broke her heart. WILDER: Classic beauty and the beast: Aleksandr Wilder’s story, the grand finale of the Chosen Ones, and the story that unites Darkness Chosen with the Chosen Ones. I hope you take this opportunity to explore all my worlds and join my mailing list for news, contests and exclusive excerpts! Here’s a sample newsletter; just fill in the box to the right under the header. All rights reserved. No part of this work may be reproduced in any fashion without the express, written consent of the copyright holders. Wilder Family Halloween is a work of fiction. All characters and events portrayed herein are fictitious and are not based on any real persons living or dead. Zorana and Konstantine Wilder have moved into their new home, a fabulous house built to replace the one that burned in the cataclysmic fire at the end of the Darkness Chosen saga. They built it on their own land, among the grape vines and tall trees in the high valley of Washington’s Cascade mountains. Now they have four bedrooms upstairs, one for each one of their sons and their wives, a master suite downstairs, and a huge attic where someday the grandchildren they have hoped for and imagined can sleep and play. Most important, Zorana has a big kitchen with stainless steel appliances, a table long enough to feed their family and friends, and a six-burner gas range and two ovens. (“Two ovens? Woman, why do you need two ovens?” “Husband, for the same reason you need a new tractor with a heater in the cab.”) End of discussion. Konstantine Wilder gloated as he walked beside the long kitchen table laden with food: Ukrainian foods from their homeland, foods like varenyky, delicious dumplings, some savory and filled with potatoes and beef, and some sweet with dark, ripe cherries. Then there were pickled mushrooms, and black caviar on shaved white ice with toast and butter. And American foods like caramel corn with mixed nuts, pumpkin bread, and his favorite, red candied apples. For the children, Zorana had prepared a bubbling bowl of black punch with a frozen hand floating in it. The frozen hand had been his idea. Such a fabulous bounty to share with their friends and neighbors who had helped them after their home had burned. But they had a half-hour before the guests were supposed to arrive, and he was hungry. He reached out a hand. “Papa, stop that right now!” Firebird paused in the doorway, a tray laden with shot glasses and a full bottle of fine Russian vodka. “No one will miss just one.” His voice rumbled deep in his chest. He had raised this child. She should show him respect. And she did … except her respect for her mother outweighed her respect for him, at least in the matter of food. “If you could stop at just one, that would be fine. But we all know you can’t, so pull that hand back or I'll go and tell Mama.” Firebird glared at him threateningly. He drew himself up to his full height. He lifted his chin. And he pulled his hand back. He pouted as he returned the glare of his darling daughter. For that was how he thought of Firebird, now and forever. Aleksandr was three and a half, the smartest, most handsome child in the world, and coincidentally, the only Wilder grandchild. Now delight filled Konstantine’s heart, and he held out his arms to hug his daughter. “— And we will all look forward to this birth in the spring. Now go put the tray in the living room before the guests arrive!” She walked around him into the kitchen to polish off the final preparations for the party. “Humph.” Turning, he went into the gigantic living room Zorana had decorated with warm colors, comfortable furniture, large area rugs, and lots of pillows and pictures. But he had done his part, too, dangling skeletons from the high ceiling, draping spider webs over the lamps, and carving fearsome faces into pumpkins grown in Zorana’s own garden. Now the lights were low, the pumpkin goblins glowed … and only his family realized that goblins were real and terrifying, and haunted the winter night. Well. After the great battle the Wilders had fought to break the thousand-year-old deal with the devil, maybe a few of the neighbors had figured out there was more to fear in this land than what they could taste and smell and hear. But they nobly pretended they knew nothing of the Wilders’ contacts with the Other World, and gave generously of their friendships anyway. He placed the platter on the tall buffet, poured a shot of vodka in each glass, and wondered why Zorana had made such a mystery of this costume she had created, and why it was taking her so long to dress. In mere moments, the guests would arrive, and it was not like his woman to be late. At the sound of someone walking gingerly down the stairs, he turned and saw his daughter-in-law, Ann, dressed in a kangaroo with a joey in her pouch. “No, Papa, why? Wouldn’t she tell you?” Ann came to his side, taking care not to trip over her own big, fuzzy feet. “Don’t worry. It will be our secret.” He watched proudly as she went to the kitchen to help Firebird spoon sour cream over the varenyky with cherries. The front door slammed, and Konstantine’s last two daughters-in-law ran in from the barn, their noses red with the brisk October autumn. Tasya held a handful of straw, and she stuffed it in her chick costume. “This stuff pokes right through the cloth and scratches me,” she complained. “Would you rather dress as a princess?” Karen asked. “Thank you.” Karen had been raised by her father to be a tough woman, a construction manager in the world’s most dangerous places. It was in one of those places she had met Adrik, and been held captive by him, and hated him. It was only after she had escaped, and he had been sent to the world’s darkest pit of despair, that he had learned to be a man worthy of her. Their courtship had been a bumpy one. All of his sons’ courtships had been bumpy. Not his. Not Konstantine’s, who had been the first male in his family in a thousand years to fall in love, and his Zorana had fallen right back in love with him. Of course, when he kidnapped Zorana from her clan, she had stabbed him. Konstantine clapped his hand over his mouth. How could he possibly keep so many secrets? Secrets from Zorana? The woman possessed a frightening ability to sense when he withheld information, and an all-too-pleasing way of worming those secrets out of him. Yet Zorana also had a way of knowing when another woman was pregnant. Maybe it was because she understood all people and the mysteries surrounding them. Maybe it was because she was a gypsy witch. “I wasn’t supposed to tell, either,” Karen admitted. “Both of you are with child?” Konstantine held out his arms to the wives of his sons. They hugged him, then hugged each other, and their cheer brought Firebird and Ann from the kitchen to make known their secrets and rejoice with the others. Konstantine assured them, “Don’t worry. I will never tell, not even under torture.” He was safe in saying that; he was almost positive Zorana would never tie him up and torture him. “You have a very funny expression on your face, Papa,” Firebird said. “I am having happy thoughts,” he answered. “We want to name our baby Antai, after my father,” Tasya confessed. “Or perhaps Jennica, after your mother,” he suggested. The four girls viewed him doubtfully. Firebird wiped her sudden tears on her tail. Karen and Tasya both held out as long as they could before they both broke down and cried. Konstantine sighed. He remembered every one of Zorana’s pregnancies, and the months when Firebird grew large with Aleksandr, and those times had been rife with weeping. Now with four women shedding tears, he would be wiping wet eyes and making comforting noises all the time. But he could buy stock in Kleenex, and he figured that was a small price to pay for four more intelligent, beautiful and mischievous grandchildren. Thankfully, he didn’t have to pay that price by himself. His sons would take most of the load. His sons, who were descending the stairs. Jasha wore a lamb costume. Rurik was dressed like a mouse. And Douglas, like his father, was a bunny — but a pink bunny. They came to their father and lined up, looking at each other and nodded approvingly. Their wives gazed at them, at the five giant, strong, dangerous men dressed as the meekest animals they could find. “Why are they laughing?” he asked. “Mama has Aleksandr, I don’t know what she’s wearing, and she said they were coming right down,” Douglas replied. Konstantine turned his gaze to the top of the stairs, and there she was: the love of his life, the warrior at his side, the bane of his existence … his wife, Zorana. She descended the stairs, graceful, serene, dressed in a black, calf-length wool skirt, black heeled boots, and a silver liquid silk charmeuse wrap top. She had a coiled whip hooked to her sash and she’d done something to her eyes, some feminine make-up thing involving smoky lines and dark smudges that made her look savage and mysterious. She held little Aleksandr in her arms. The boy was dressed like a wolf, and looked like the child in Where the Wild Things Are. “Let the wild rumpus start,” Konstantine murmured. Aleksandr spread his arms wide. He growled and ran at his father. Douglas screamed like a little girl and hopped away. Aleksandr growled and chased Jasha and Rurik and Adrik, and Konstantine, and when Konstantine tripped over his big bunny feet and tumbled to the floor, Aleksandr put his foot on his grandfather’s chest and roared in triumph. He paid his rude sons no heed, knowing well they loved and admired his speeches. He gestured toward the krasny ugol, the red corner. There, in this holy place in their home, Zorana had reverently placed their hard-won and ancient icon on a red satin cloth. Four different aspects of the Virgin Mary portrayed joy, sorrow, pain and glory, and now looked upon his family. This was the icon which a thousand years ago had been cut by the devil’s sword. And only last year had been the pieces been reunited into one holy icon — and that joining had broken the evil pact and freed the Wilder family forever. Now all was as Konstantine and Zorana had foreseen. His sons were married to the loves of their lives, and this year would bring four, or perhaps five or six, new additions to the Wilder clan. His family solemnly nodded, and hugged, and the women wept. Return to the survey and vote for your favorite cover! Please take this opportunity to explore all my worlds and join my mailing list so I can notify you when my new titles are released! 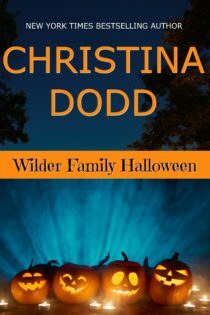 For you collectors — you can always read WILDER FAMILY HALLOWEEN here on my website, or if you wish, you can buy WILDER FAMILY HALLOWEEN in eBook for 99 cents.